The brand's most beloved sneaker gets tweaked to ring in the new year in style. Keeping track of New Balance's catalog of numerically-named sneakers can be tough to the uninitiated, but almost everyone knows the 574 when they see it: it's the vintage-inspired running style with a big "N" on the side that's as stylish as it is un-pretentious. Since the 1990s it's dominated mall store shelves and been a staple that's basically ol' reliable for regular guys, dads, and even sneakerheads (in the right exclusive colorways, of course). But now NB has re-tooled the 574 and given it some modern touches to bring it into 2018. In 2017, New Balance gave the 574 a slightly sock sneaker twist via the 574 Sport (and the true sock sneaker 274). The new true-blue 574 gets updates that are a lot subtler. The toe now curves upward less at the toe, giving the shoe a sleeker, more angular silhouette. It's also got a single-piece lining for added comfort and an overall slimmer profile that makes it feel more 2018 than 1998. But the timeless style that made the 574 a hit in the first place is hardly changed. 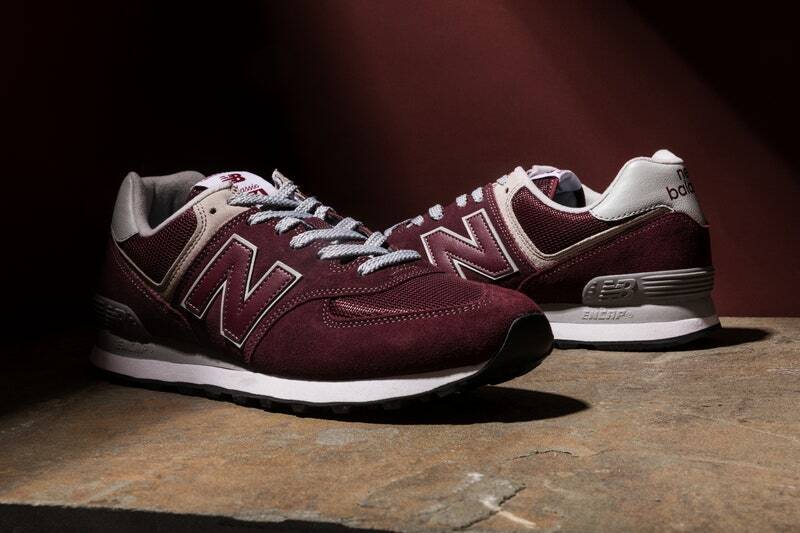 The initial drop of this facelifted 574 comes in hues every guy can get behind: navy blue, olive green, and our personal favorite burgundy. Why? Because if you're a guy in 2018, you've probably got enough navy blue kicks, and though olive green and dark denim is one of the sweetest combos out there, a pair of crisp chinos with burgundy kicks feels, just like these new 574s, a touch more modern.